"We are always going to speak up for human rights," the foreign affairs minister said. While Foreign Affairs Minister Chrystia Freeland said Ottawa will wait to hear more details from Saudi Arabia before responding to the country's decision to freeze new trade deals and expel Canada's ambassador, she defended Canada's position, insisting Ottawa will always stand up for human rights. 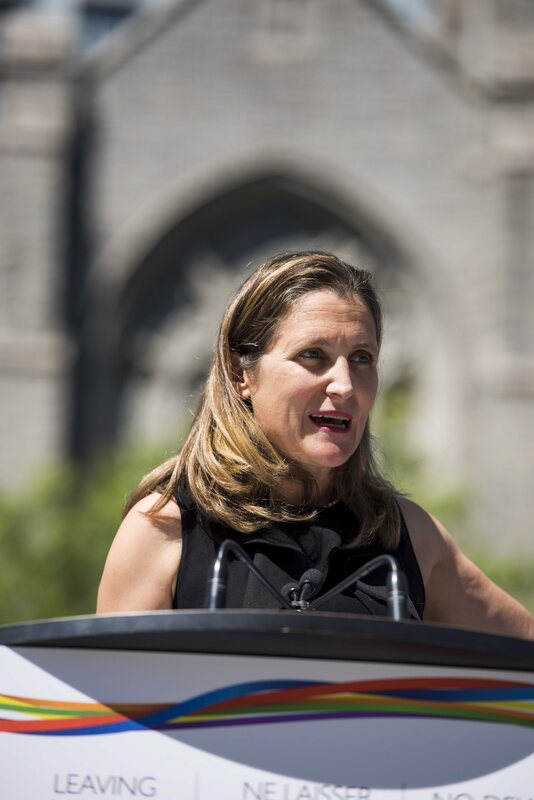 Speaking to reporters in Vancouver on Monday, Freeland said Canada is "very comfortable" with its position that led to the new measures announced by Saudi Arabia. "We are always going to speak up for human rights, we are always going to speak up for women's rights and that is not going to change," Freeland said. Freeland said Canadians "expect" its foreign policy to be driven by Canadian values. Foreign Affairs Minister Chrystia Freeland speaks at a press conference in Vancouver, B.C. on Monday. Saudi Arabia's move to freeze new trade deals could threaten Canada's $15-billion arms deal that includes providing armoured vehicles to the country, but Freeland called it "premature" to comment on the status of the deal, or the economic consequences of the move. Thomas Juneau, an assistant professor at the University of Ottawa, said because the statement Sunday from Saudi Arabia specified that new trade deals will freeze, it is difficult to determine what the economic impact will be. On one hand, it would be a bad scenario to cancel the arms deals, but on the other, many human rights groups have criticized Canada's decision to sell armoured vehicles to a regime with a "horrible human rights record," Juneau said. Freeland's comments come a day after Saudi Arabia made the decision in retaliation to a Global Affairs tweet that "Canada is gravely concerned about additional arrests of civil society and women's rights activists in Saudi Arabia, including Samar Badawi. We urge the Saudi authorities to immediately release them and all other peaceful human rights activists." Freeland would only tell reporters Monday that the Canadian ambassador is "fine" and would not disclose his location. Freeland said the embassy in Saudi Arabia is still in place and providing services to Canadians. Bessma Momani, an analyst on Middle East affairs and professor at the University of Waterloo, said the move will resonate domestically. Momani called it "getting tough on Canada", which she said other countries in the region might welcome if they view Canadian foreign policy to be led by human rights concerns. At the same time, it sends a strong message to European countries but also countries in the Middle East not to "mess" with Saudi Arabia, Juneau said. "There is a clear, uniquely Saudi dimension to this in the sense that in the last three years, Saudi Arabia has been behaving very aggressively and assertively in the Middle East," he said, noting the blockade of Qatar and the war in Yemen. "For Saudi Arabia to punish Canada, it's fairly easy because we're not an important country for them, either are they for us," he said, adding that it does send a message to others that it will not accept criticism. Meanwhile, Saudi Arabia's Ministry of Media said in a tweet earlier Monday that it is investigating a Twitter account that posted a photo of an Air Canada plane heading toward the CN Tower, eerily reminiscent of the 9/11 attacks. The ministry said it ordered the owner of the account to shut it down while investigations are completed.